Thanks to Jasper Klinkhamer from Studio Klink for sending us photos of the Peet House (aka: the Rabbit House) in Lelystad, The Netherlands. 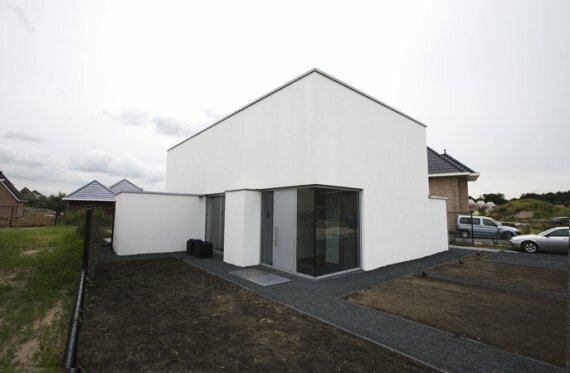 Construction has just been completed on the house, which is the first built project from Studio Klink. 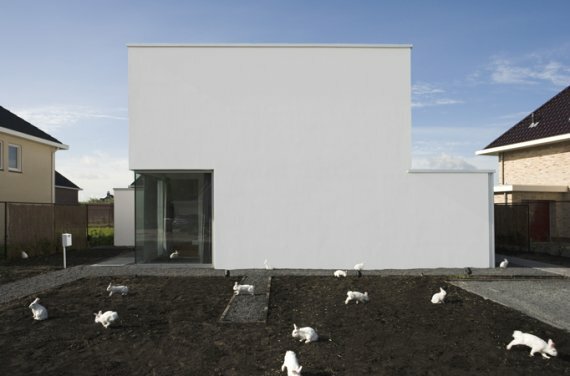 Apparently the minimalist house is very attractive to rabbits. When photographer Lars van den Brink showed up to take photos, it was completely overrun by the furry critters. Visit the Studio Klink website – here. 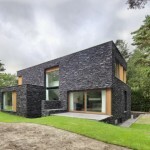 Villa Peet was designed as a sequence of contrasting spatial experiences. These contrasts create a feeling of entering new worlds behind a series of rabbit holes. The absence of traditional interior doors gives the ground floor a sence of continuity, although the different space are well defined. The entrance hall: high. 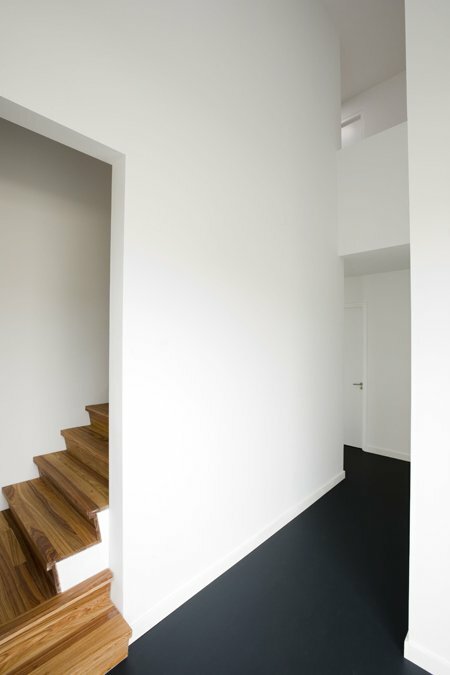 A glimpse of the stairs and a small balcony give a hint of the world above. Central axis: long. After turning the corner in the hallway one looks through the whole house straight into the garden. The kitchen/dining: wide and high. 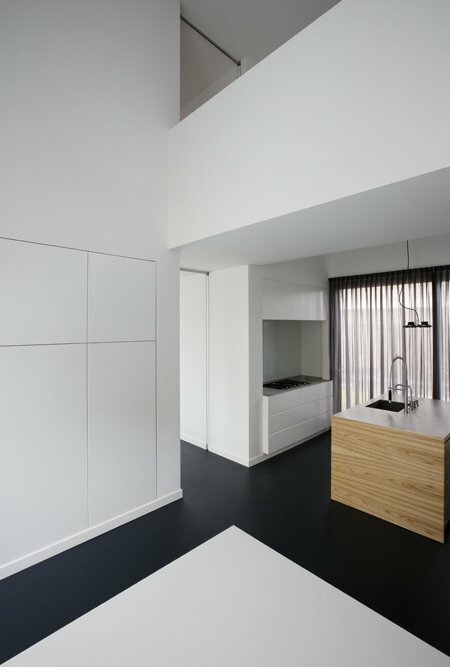 A brigde runs through the room and divides the spaces for cooking and eating. The living room: panoramic and intimately low. The garden seems to surround the house from and open but intimate space. On the upper floor the guest rooms are divided from the private bedrooms by the voids in the kitchen. Seen from the street the house seems to be a very closed volume without windows and just one corner with glass and a door. Despite this first impression the house is very light and transparant and gives views to the garden from everywhere in the house. 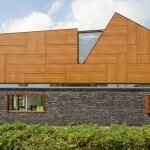 The rooms are orientated to the sides and the back because of the clients wish for privacy. The plans are organised in a way that the further from the street they are more private they become. 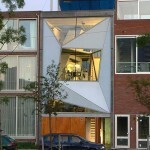 Studio Klink is is a young architectural studio based in Amsterdam, The Netherlands, founded by architect Jasper Klinkhamer (as JKav) in 2005. 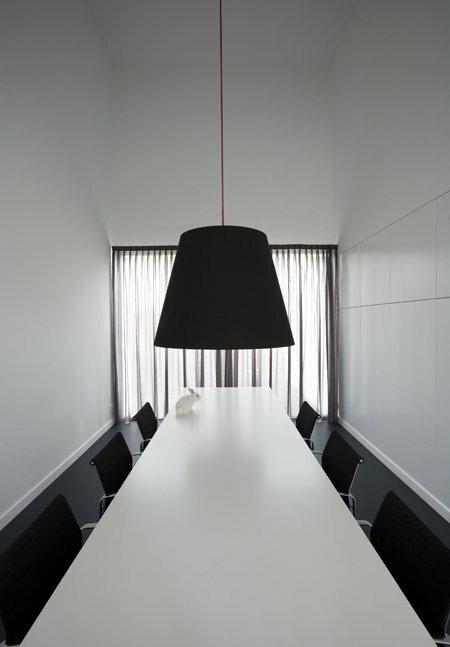 Studio Klink works on a great variety of projects like houses, offices, public buildings and art projects. Among its clients are project developers, local governments, cultural institutions and private clients. Studio Klink is a founding partner of Urban Alliance (www.urbanalliance.nl), which won the price for most innovative new company of Amsterdam and Northern Holland 2007 for it’s projects in which architecture and new media are united in interactive media objects.